Drowning remains the third leading cause of unintentional injury-related death in children under age 19 and the leading cause of unintentional injury-related death among children ages 1 to 4. The majority of drowning and near drowning occurs in residential swimming pools and in open water sites. However, children can drown in as little as 1 inch of water and are therefore at risk of drowning in wading pools, bathtubs, buckets, diaper pails, toilets, and hot tubs. Most drownings occur in the home setting, especially in home pools. They happen most often in the summer between May & August, typically on weekends. Safe Kids Grand Forks has a Water Safety Subcommittee that has put together many resources for keeping kids and families safe in and around water, whether that be in the home, at a pool or near a lake or river. Remember, water safety skills are ones that you will use for a lifetime. Make water safety training a part of your priorities for teaching your children. Water safety is a life-long skill and one that all children should be exposed to at a young age. Whether you are boating on the river, camping by a lake, fishing in a stream or swimming at a pool or other outdoor body of water, knowing the dangers of water and how to prevent a drowning is important. Each spring, the Altru Family YMCA offers a class entitled "Safety Around Water". This 30 minute water safety and swim lesson class is designed to teach kids those important water safety lessons. Kids enroll in a time slot and attend class 4 days during the week at that designed time. This class is FREE and is intended for those that have never had lessons before or those that cannot afford swim lessons. Registration is required. For more information, contact the Altru Family YMCA at 701.775.2586. Registration begins in April for May classes. 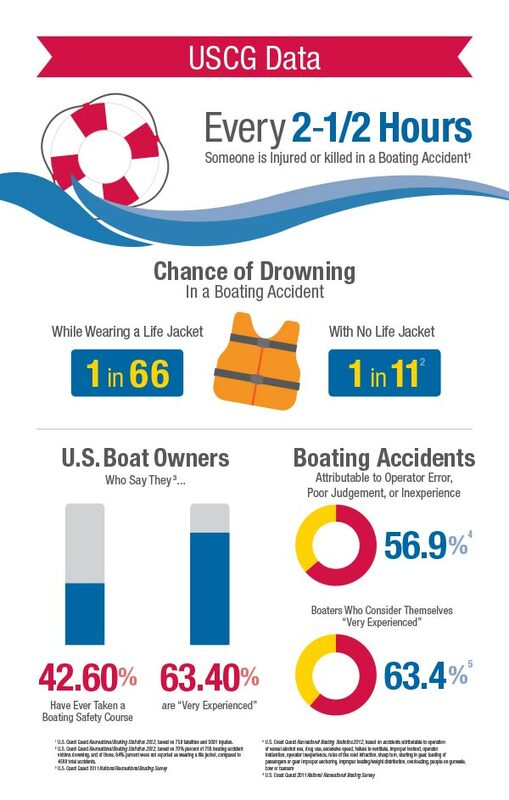 Drowning incidents in the United States are most often associated with people on boats who were not wearing a life jacket. These drowning incidents involve people who are usually close to shore, not in large, open bodies of water. The US Coast Guard Auxiliary is a partner in our water safety initiatives and they provide great resources on boating and water safety. For more information, visit their web site by clicking on the icon at the right. Annually, Safe Kids Grand Forks and the US Army Corps of Engineers present a water safety and boating course entitled Kids Don't Float. Children in grades 2 - 6, along with their parents or teachers are invited to participate in this 2-hour course offered at the UND Hyslop pool. During the day, selected classes from the Grand Forks School System and surrounding communities attend the course. Class participation (school and grade) varies somewhat from year to year. 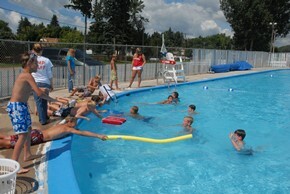 Classes take place at the UND Hyslop Pool. Major event sponsors include: U.S. Army Corps of Engineers, University of North Dakota, ND Game & Fish, US Coast Guard Auxiliary, Altru's YMCA, Choice Health & Fitness and Safe Kids Grand Forks. Watch this video to see what to expect from a class! Water safety is an important life-long lesson, especially for children with special needs that tend to be attracted to water and also are prone to wander. Safe Kids Grand Forks has assembled a team of partners to help us enhance our water safety abilities in working with children with special healthcare needs. We are grateful to several partners who have offered grants to make purchase of supplies for this class available and to the members of our team that have dedicated their time to this effort. We also thank United Way of Grand Forks - East Grand Forks for their financial support to assist with offsetting some of the costs for the adaptive aquatics course for those in need. There will be an on-line learning module that will need to be completed PRIOR to coming to class. This should take no more than 1-2 hours to complete/review. For more information on our next training dates, please contact Safe Kids Grand Forks at 701-780-1489. Water safety is an important life-long lesson, especially for children with special needs that tend to be attracted to water and also are prone to wander. This course will offer young children and youth the opportunity to get accustomed to water and steps to keep them safe around water. The course is an introductory class, not designed to make them a proficient swimmer, but rather to learn safety tips and to get them comfortable with being in and around bodies of water. Lessons will be 1:1 or 1:2 with the instructor as deemed appropriate. This class session will focus on children with intellectual disabilities who are in Kindergarten-5th grade. Class size is limited, so register early! Under 30# - These are designed for an infant and have additional cushion/floatation in the head and neck area to help babies float with their face up and out of the water. 90# and above – These are designed for adults or children over 90#. Wearing a proper fitting life jacket is important for people of all ages. Each new boating season, the life jacket should be tried on for size and proper fit. Just as we make sure our winter coats fit from one season to the next, life jackets should be fitted annually as well. 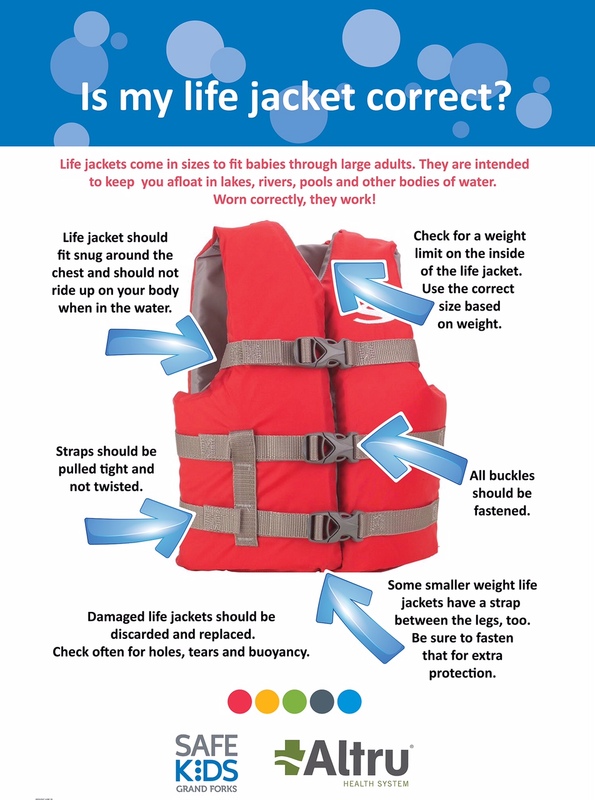 For information on fitting a life jacket, selection and care, click here. This information is available in a poster sized display (as shown above). 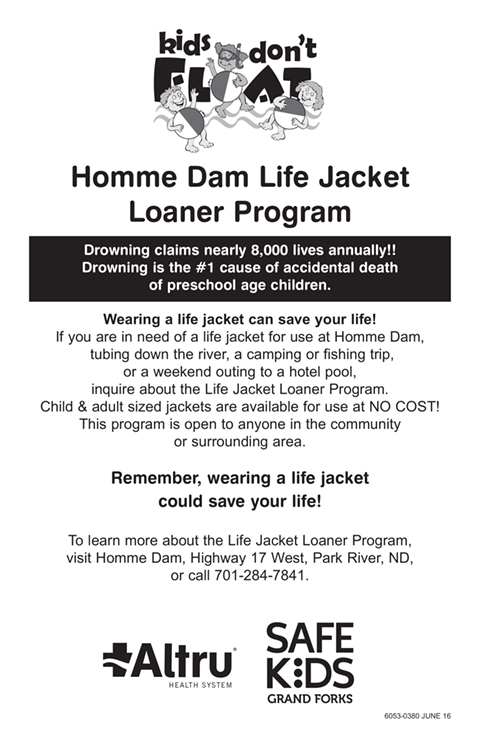 For a copy of the life jacket fitting poster, contact Safe Kids Grand Forks. To download a copy, click here (pdf version) or here (jpg version). Safe Kids Grand Forks has two options to make life jackets accessible for the people of our community and region. These include the sale of life jackets and our Life Jacket Loaner Program. Life jackets for sale: We sell the above sizes of life jackets at our Safe Kids Office. For pricing, click on this link. Life Jacket Loaner Program: In an effort to make life jackets readily available in communities with partners, we have created a Life Jacket Loaner Program where residents can check out a loaner life jacket for up to two weeks, free of charge. Much like borrowing a library book, the user simply fills out a form with their contact information and agrees to bring the life jacket back after two weeks or be billed for it. While having a pool in one’s backyard can provide for lots of family fun, it also comes with a great deal of responsibility. From keeping it clean to assuring the safety of those children using it or others in the neighborhood, there are lots of things to keep in mind. Most communities have city ordinances that require 4 sided fencing around any below ground pool. That is not the case with above ground pools and as they have gained popularity, more and more of these are making their way into residential neighborhoods. It is important for parents and caregivers to know where pools are located in their residential neighborhoods so as to keep children safe. Water can be intriguing and young children often toddle off to explore their environment. Drowning is a silent killer so children could be in trouble in the water and adults may not even be aware. Most children were being watched by an adult just before they drowned. Drowning is one of the leading causes of death for children. Home swimming pools are the most common place for a child younger than 5 to drown. The following resources provide information on pool and spa safety for both pool owners and parents and caregivers in general. 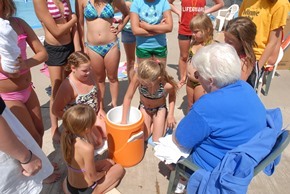 For this class, we like to partner with local community swimming pools and their lifeguard staff. 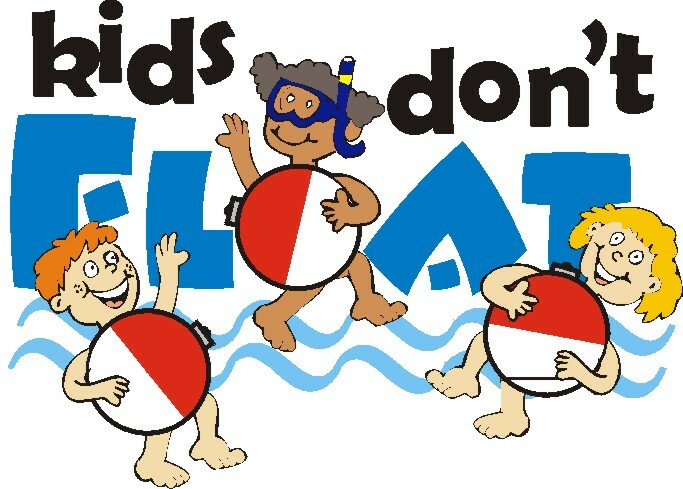 Our water safety volunteers will come and provide the interactive presentation and then we have kids actively engage in water and pool-side activities (Can also be done without getting into the pool but kids love the water!!). The class can be customized to meet the time restrictions at the pool but we would encourage the class being at least 1, and up to 2 hours in length. Safe Kids Grand Forks will schedule and work with local pools (indoor or outdoor) to schedule these for their communities. Please contact us directly to schedule. Safety in and around water is a life-long skill that will assist people whether they are at a lake, a hotel swimming pool, in a hot tub at their home or fishing by the river. We promote and encourage parents and caregivers to enroll their children in swimming lessons at an early age (recommended at least by age 5). We have three wonderful partners in our swimming lessons promotion who offer lessons for children in the Grand Forks community. For other locations, we suggest checking the web sites of local pools or your park district. In Grand Forks, the following offer lessons and have been long time partners with Safe Kids Grand Forks and their water safety efforts. Click on the logos below for registration information on these swim lesson programs and to get your child enrolled today. Each spring, Altru’s YMCA offers FREE swimming lessons for one week to those that cannot afford to pay for lessons or those that would like to try out swimming for a short period of time. For more information on this program, contact the YMCA at 701.775.2586. The classes are usually held in early May but dates vary each year. The Safe Kids Water Watcher’s Program was designed to add another layer of protection in and around pools. The concept behind this program is that “Seconds Count!! Supervision Saves!!”. Often times when kids are swimming or playing in and around water, other social activities are taking place or parents are simply relying on a lifeguard to keep their children safe. It is known that having adequate and ACTIVE adult supervision around water saves lives. Active supervision includes an adult that is within arm’s reach of the child and is not distracted by other activities such as eating, reading a book, napping or visiting with other people. By assigning a person who is the “Water Watcher”, it assures that someone is watching the children under their care. If and when that person needs to do other duties, they assign the Water Watcher duty to another responsible adult. The program is effective when used at a lake, pool or other body of water. 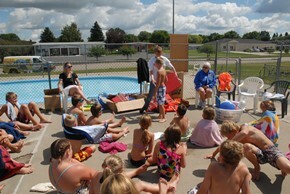 Safe Kids Grand Forks has several components to the program that are available to pool owners or public pools. These include a water watchers tag with program instructions and safety tips, a Water Watcher vinyl cling for pool doors or hotel room mirrors, a Water Watchers pool sign and a Water Watchers safety brochure.